The Islamic State group (IS) in Egypt’s Sinai has in a 22-minute video called on its fighters to attack the Islamist movement ruling Gaza over its combat against members of terror group in the enclave strip. “[Hamas] uses its smuggled weapons to empower that which was not revealed by God. 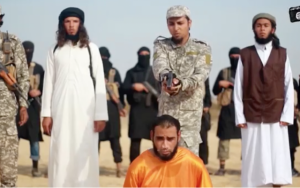 It also fights supporters of the Islamic State in Gaza and the Sinai and prevents the migration of these supporters from Gaza to the Sinai,” said the video speaker identified as Abu Kazem al-Maqdisi, an IS preacher in the Sinai. Maqdisi was originally from Gaza, Times of Israel reports. IS branch in the Sinai has been waging militancy against Egyptian military and police on the peninsula. Attacks have gained steam since 2013 following the removal of Islamist President Mohamed Morsi who was known as friendly to Hamas. New ruler Abdel Fattah al-Sisi who deposed President Morsi has accused Hamas of helping the terror group through weapon smuggling or sheltering of jihadists in the enclave. Isolated following the fall of President Morsi, fallout with Iran over Syria, Hamas has turned to Egypt to improve life conditions in Gaza and on good faith, the Islamist movement beefed security along the border with Egypt and engaged a crackdown on members of IS and Salfis. In the video, IS criticized Hamas for not preventing US President Donald Trump’s December declaring Jerusalem capital of Israel. The video began with a clip of Trump’s announcement from the White House. The video also lambasted Hamas for failing to fight Jews for the right reasons, the Israel media notes. IS wants Hamas to fight the Jewish religion and not just Jewish settlements in occupied Palestinian territories. The terror group also chided Hamas for embracing democratic values by participating in elections with Fatah, the Gaza-based movement’s rival in occupied West Bank. IS also rebuked Hamas for being an agent of Iran. The video ended with the execution of one former IS member named as Musa Abu Zamat. He was shot in the back of the head by executor identified as Muhammad al-Dajani, who according to news reports was former member of the Hamas’ military arm, the Izz a-Din al-Qassam Brigades. Abu Zamat, Maqdisi noted was sentenced to death for smuggling weapons to al Qassam Brigades. Hamas Thursday indicated that Israel fabricated the video to smear the resistance. The video is “a Zionist production in which Arab tools participate to distort the resistance…This is what the Zionist intelligence agency and its lackeys have been striving for,” twitted Salah Bardawil, Hamas spokesperson. Written by: KanelkaTagba on January 5, 2018. Posted by KanelkaTagba on Jan 5 2018. Filed under Headlines, World News. You can follow any responses to this entry through the RSS 2.0. Both comments and pings are currently closed.